While Hawaii does not boast the most formal dress code in the world it doesn't hurt to know what colors are respectful when celebrating Chinese New Year in Hawaii. You may not want to dress in complete costume like the lady in the photo above, but here are some tips to stay Hawaii casual and Chinese New Year respectful. Red, red, red! You will see the color red everywhere and for good reason as it represents good fortune. From decorations on buildings, lanterns, flags, and signs with meaningful symbols, you will see the color red. Find a red shirt and wear it proudly, even better an Aloha Shirt that is red, or accessorize your outfit with an accent of red to show everyone you understand the importance during this celebration. Black is associated with death and white is a color used during funeral ceremonies so avoid these if possible. Don't fret over perfection though, a bright red shirt or blouse with black shorts shows everyone you clearly understand what to wear. If you forget on the way, there are always t-shirt vendors at the festivities who would be more then happy to help you out. Everyone talks about where to park in Hawaii, everyone. The good thing about Chinatown on Oahu is that it is located right next to downtown Honolulu. Since the majority of Chinese New Year celebrations happen in the evening almost all of them are open and with lots of spaces available. Chinatown Cultural Plaza. This parking structure does not show up on Google maps but we like it because the stairs lead down into the plaza where a majority of vendors and events occur. Parking here and visiting the cultural plaza will give you an excellent experience without ever having to cross a street. This may be a deciding factor if you have mobility or safety concerns. Use this Google Link and you will see a building with a restaurant named Pho Huong Lan on Maunakea St. This is the parking structure and can be accessed via Maunakea. If you are fortunate enough to receive an envelope from someone be sure to follow these two rules. Receive the item with both hands if at all possible. Do not open the envelope (gift) in front of them or right away as this is disrespectful. If you are planning on giving gifts during Chinese New Year, in particular, red envelopes with money, here are a few tips to consider. Take the time to go to your local bank and ask for crisp new bills. Using these in your envelopes is a sign of respect and shows sincere intention. If you are presenting to a group or family be sure to give the eldest member present the gift. Remember, if they do not open the gift and put it away or to the side they are showing respect by not opening it in front of you. Elders make this a special time to give money envelopes to children as it will bring them good fortune and good luck. 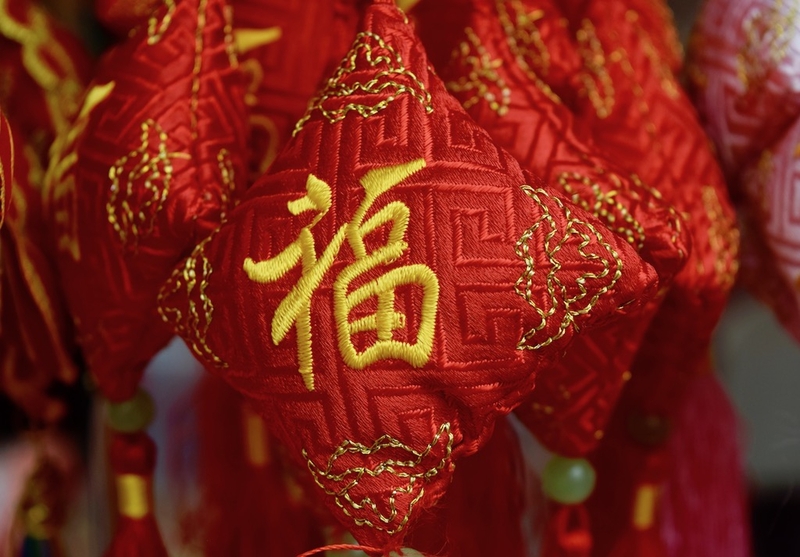 Symbols and Numbers are very important in Chinese culture, here are a few to be aware of when celebrating Chinese New Year in Hawaii. The number "4". Avoid this number if you can and avoid groups or dollar amounts of 4. It is the pronunciation of the number 4 that makes it one to avoid. The pronunciation of 4 is similar to that of the word death. All other numbers are fair game with the number 8 being of particular good fortune for a similar reason that the number 4 is unlucky. The number 8 is pronounced "ba" and sounds very similar to "fa" the word for prosperity. The Red Envelope. We talked about giving and receiving a red envelope in the previous section but it deserves another mention. The Red Envelope is used during Chinese New Year, Weddings, Graduations, and other significant events. All major Chinese New Year events will have someone selling packs of envelopes. Fireworks! We love them until we try to fall asleep. If you are planning on lighting fireworks for Chinese New Year in Hawaii you need a permit from Satellite City Hall, be sure to apply at least 10 before the event date. If you don't have a permit don't fret, almost every single business in Chinatown will have several strings ready to blow during the celebration. If you follow the lion dance groups around Chinatown they will stop at each business and perform while the firecrackers are lit. Between the popping of firecrackers, banging of drums and cymbals, and all the smoke, we recommend a couple items for your personal health and safety. Ear Protection. You will see the majority of members who perform with the Lion Dance groups are wearing hearing protection. Young children and those who will be celebrating all night should come prepared. Masks. Chinatown is relatively small area with lots of businesses, meaning lots of fireworks in a confined space. Depending on the wind this can mean the smoke will "sit" and its very thick. If you have any respiratory challenges we highly recommend coming prepared.